Welcome to the first week of the Superbowl Snack Throw Down! Please make sure you run right over to Highlowaha to vote for your favorite snack (pick me! pick me! pick me! ); you have between now and Sunday night to make your preference known (pick me! pick me! pick me!). Our "secret ingredient" was sausage (thank you SO much to the readers who voted sausage over shrimp! 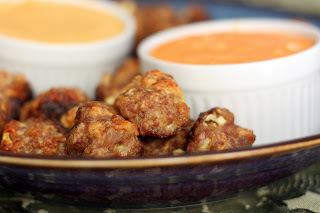 ), and I was immediately reminded of the "sausage balls" that my cousin often makes. I don't even LIKE sausage, but can't seem to stop popping these babies when she brings them to family events. I was inspired by the recipe on the Jimmy Dean package, but wanted to spice them up a bit. 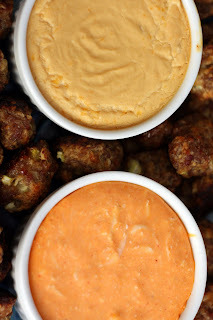 Since the first Monday Night Football game features the Buffalo Bills at the New England Patriots, I thought I'd whip up two dipping sauces, paying homage to each region. The buffalo dip had an awesome kick to it, but that didn't deter my two-year-old from going to town. Granted, he adores any food he can dunk, so these were right up his alley. The Sam Adams cheddar dip was really an interesting blend of flavors. In all honesty, I was a bit hesitant about this one, but was pleasantly surprised. I loved the smoothness of the cream cheese, and the beer really gave it that extra something special. These little treats disappeared very quickly at my house, and I can only imagine their popularity on game night. Preheat oven to 375 F. Combine all ingredients in a large mixing bowl; stir well. Form into 1” balls. Place on ungreased baking sheet; bake 18-20 minutes or until golden brown. Remove from oven; cool 5 minutes before removing from pan. Serve with cocktail forks or toothpicks. Preheat oven to 350°F. In medium bowl, beat cream cheese with electric mixer on medium speed until smooth. Beat in dressing, buffalo wing sauce and 1-2 tablespoons of water until blended. Stir in cheese. Spread in ungreased 1-quart baking dish or 9-inch pie plate; cover with foil. Bake for 30 minutes, or until bubbly; top with onions (a step which, from the photo, you can see I forgot!). Preheat the oven to 350 and coat the inside of a 1-quart baking dish with nonstick cooking spray. Melt the butter in a medium-size saucepan over medium-high heat. Add the onion, and sauté for 2 minutes, until the onion begins to soften. Add the mustard, cream cheese, and beer, stirring until the cream cheese is melted. Remove from the heat and stir in the Cheddar cheese, a handful at a time, until it is all incorporated. Bake the dip for 20 to 25 minutes, until bubbly. Serve warm. PS I made the basil Lasagna on Tuesday night wonderful!!!!! Yummo!!! I need to eat this immediately. I think I will be at your house for every football game from now on. 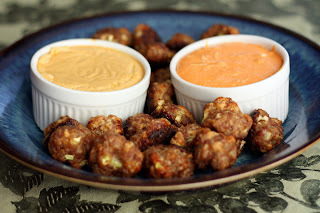 I've made these sausage balls for the holidays and I'll have to make these dips to pair with them! Thanks for posting! Just had to say "hi". I've been looking around all afternoon, and you have a great site! Love the recipes. Thanks. This look awesome! I will definitely have to remember this recipe to try for my next football party.